Step 1 Heat the oven to 350 degrees. Toast the pine nuts on a baking sheet in the oven for 5 to 7 minutes, or until very lightly browned. Let cool, finely chop, then set aside. Step 2 In a small bowl, stir together the flour and salt. Set aside. In a standing mixer or in a medium bowl with an electric mixer, beat the butter until light and creamy. Beat in the sugar until blended. Beat in the egg and vanilla. Step 3Beat in the flour and salt until thoroughly combined. Beat in the thyme, apricots and pine nuts until evenly mixed. Step 4Divide the dough in half. Shape each half of the dough into a log about 9 inches long. Make the logs as smooth and even as possible. Wrap the dough in plastic wrap, waxed paper or aluminum foil. Twist the ends to seal. Repeat with the second half of the dough. Chill the cookie logs in the refrigerator overnight. Step 5Heat the oven to 350 degrees. Unwrap the logs and cut each log into one-fourth-inch thick slices. Place slices on silicone-lined baking sheets. Bake 12 to 13 minutes until lightly browned around edges. Remove cookies to a wire rack to cool. Store the cookies in an airtight container. In Recipes-list.com we have selected the most viewed recipes from category - Desserts . Enjoy the best recipes specially selected for you! 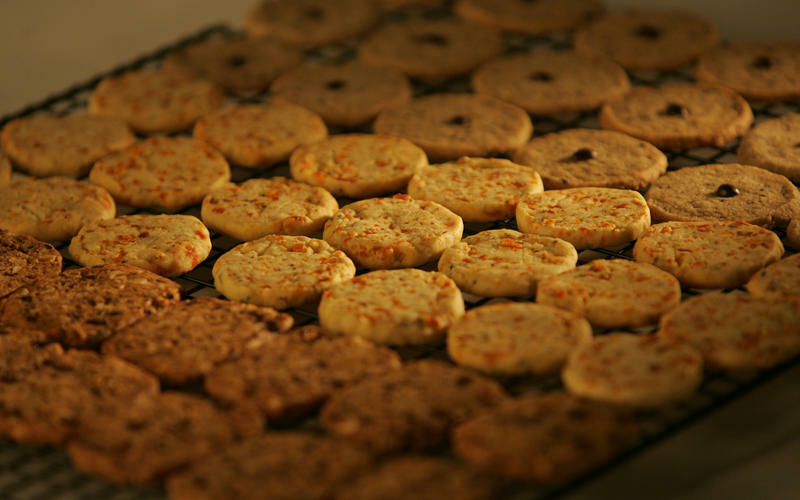 Apricot butter cookies is the right choice that will satisfy all your claims.